There is no doubt: we love and live Gantt charts. Our Gantt chart control VARCHART XGantt has been providing consistent value to .NET, ActiveX and ASP.NET scheduling application developers for more than 20 years. When working on the next version of such an established product, many companies tend to "just" add features and functions here and there. 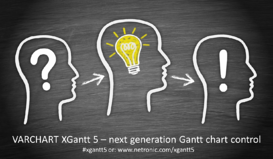 With our new version of VARCHART XGantt, we aimed at doing differently. We tried to look at the Gantt chart from a distance, and asked us what new characteristic we should add to it to actually get the potential of inspiring its users. We found an answer ... and call it VARCHART XGantt 5. It goes without a saying that today's Gantt charts are way more than the reporting tool of the "good old days". In today's time-sensitive business environments, Gantt charts deliver the most value when used to support agile short-term planning and scheduling processes. This is even more true, if one manages to focus the Gantt chart on the decision relevant information. We made this thought the leading idea for VARCHART XGantt 5 - and hence put much emphasis on completely redesigning the "interaction experience". VARCHART XGantt 5 is the next generation of our Gantt chart control especially for .NET scheduling application developers. It should answer the question raised in the title of this blog post: Can a Gantt chart be inspiring? Have a look what we imagined and how we got inspired! What do you think? Can a Gantt chart like this inspire you and your customers?